It was high noon when we stepped into Santa Rosa, the local market, in search of fresh ingredients. We'd invited fifteen hungry friends to our home for dinner and we wanted to welcome them with a feast: a bubbling pot of garden-fresh tomato sauce, courtesy of an old family recipe. A cacophony of voices and the odors of decay and freshly cut flowers assaulted my senses as I strolled toward the vegetable section. Then I spotted her—A Peruvian casera, or vendor, who had traveled from her farm on the coast to sell produce. Her smile reminded me of one of the reasons I fell in love with Perú: the genuine friendliness of the people. The day’s special? Fresh tomatoes, one kilo for just one Nuevo Sol, or about 2.2 pounds of homegrown tomatoes for thirty-five American cents. To make things interesting I purchased seven kilos, or a little over fifteen pounds, of homegrown tomatoes. After carting home my enormous load, I was more ready for a siesta than an afternoon in the kitchen! Nevertheless, the challenge was on. The thought of blanching and peeling so many tomatoes was overwhelming. So why not roast them in the oven? Like tomatoes grown on American soil, Peru´s tomatoes tend to be acidic. Roasting sweetens the tomatoes and concentrates their flavor. It would lift my homemade sauce to new heights. I gave the tomatoes a cool bath in the kitchen sink, crowded them onto two cookie sheets, popped them into a 350F oven and baked them for about an hour. Skins just beginning to split, they were soft and juicy. After letting them cool a bit I quickly peeled them and pulsed them in the food processor in batches, being careful to leave enough chunks to add texture to my sauce. Then it was a matter of adding onions, garlic and spices and voila! A batch of spaghetti sauce big enough to feed a crowd. Roasting the tomatoes gives this satiny sauce depth of flavor and natural sweetness. 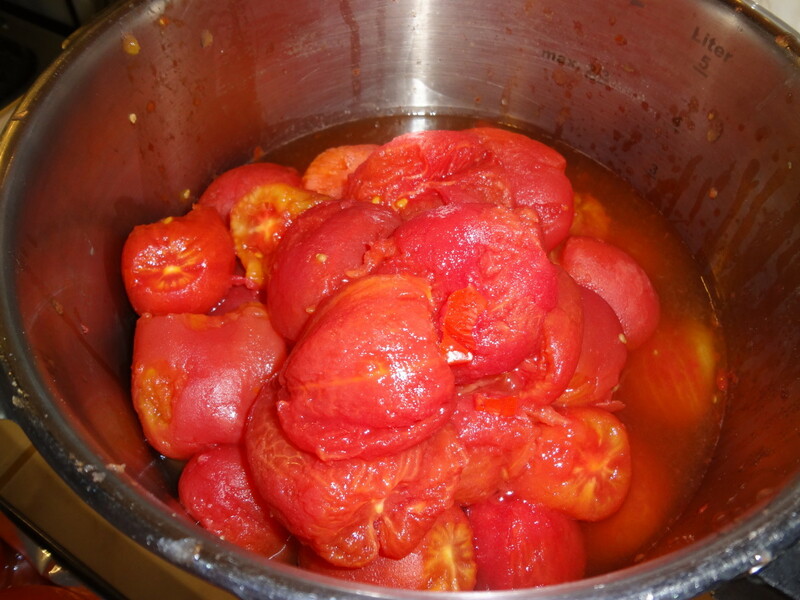 In case you don't have seven kilos of tomatoes, I've halved the recipe for easier preparation.With just eight main ingredients and eight herbs and spices, the sauce comes together quickly. Enjoy! San Marzanos are grown near Sorrento, Italy, where the soil imparts special flavor to these tomatoes. Most importantly, these tomatoes have a sweet rather than acidic flavor profile, which makes them superior to most varieties available in North American supermarkets. The packing method used by Italbrand preserves the sweetness of these vine-ripened tomatoes better than any other brand I've sampled. This is the brand I recommend if you decide to use canned tomatoes. If using canned tomatoes, please my recommendation, above, for the best brand. 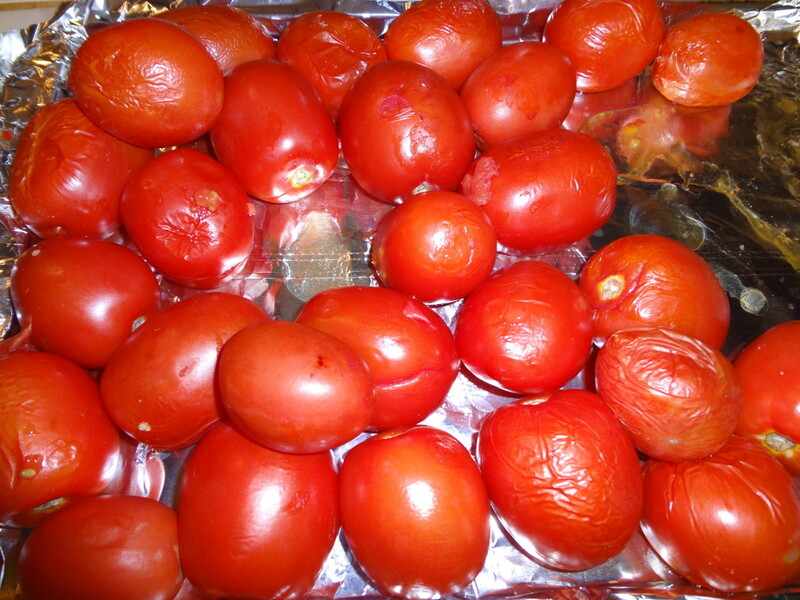 Fresh Romas are ideal cooking tomatoes as they're fleshy, thick-walled and contain fewer seeds. However, any tomato can be used as long as it's ripe and flavorful. Choose ripe tomatoes. Leave the green ones to ripen on the windowsill. If tomatoes are very seedy, squeeze out most of seeds before blending and compensate by adding an extra pound of tomatoes to the pot. Don't be afraid to cook with anchovies. The hairy little fish will melt away without a trace and give your sauce amazing flavor. Substitute red wine or chicken broth for the water in the recipe. Use fresh or dried basil and oregano. If your tomatoes are very acidic, try oven roasting the onions to sweeten the sauce even more. Ground beef or pork, browned and added to the sauce, will also help round out flavors. Since tomatoes vary in sweetness, it’s important to taste the sauce as it simmers. After about an hour, the sauce will reduce and you can begin to sample it. Add more tomato paste for rich flavor and deeper color, more liquid if sauce is too thick, sugar if too sour or bitter. Add more herbs and spices according to preference. Simmer sauce for at least two hours, if possible. Make the sauce a day or two in advance and it will be even more tasty once the flavors marry. I needed two pots to start a 15 pound batch of tomato sauce. After simmering for about an hour, though, the sauce had reduced enough to fit into my 8-quart dutch oven. * If the tomatoes are a meaty variety such as Roma, you can use less tomato paste. Start with 1/2 cup (120 grams) and add more as needed. In a large dutch oven-sized pot saute onion, garlic and anchovies (if using) in oil and butter, over medium heat, until softened. 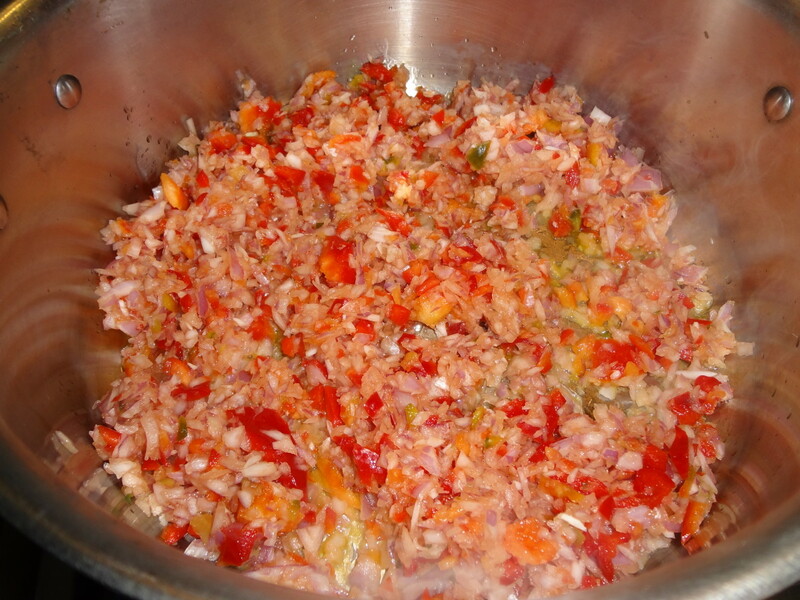 Add tomatoes, tomato paste, liquid, the herbs and spices, sugar and salt, stirring well to combine. 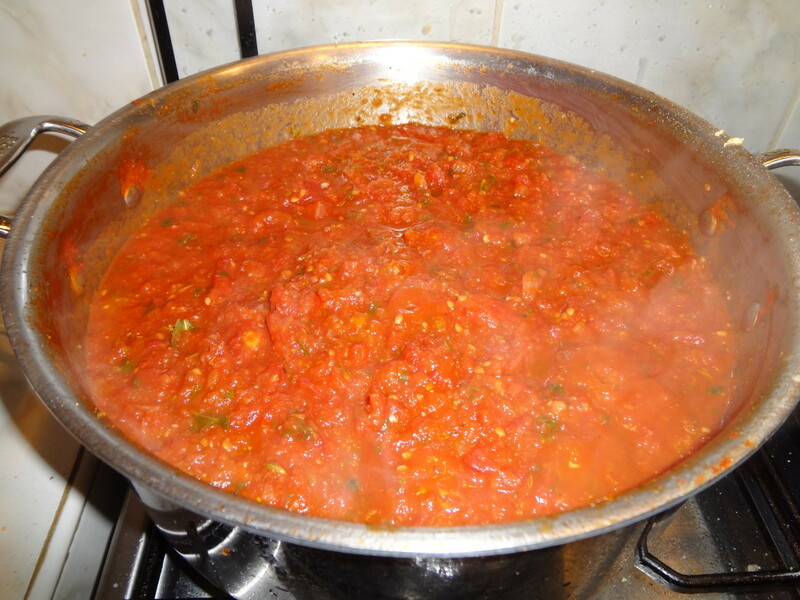 Gently simmer for 2 hours or longer, until tomatoes have broken down and sauce is deep red. Add parsley and simmer for 20 minutes more. Serve over pasta with freshly grated parmesan cheese. This sauce becomes even more flavorful when simmered with meatballs or chicken cacciatore. You could also serve it over fried eggplant for a delicious eggplant parmesan. Which Italian-style meal do you prefer? I’m so happy to hear you enjoyed the sauce, RoyBSmith. The spicy pork sausage and green peppers sound delicious! It was, as far as I remember. Now I buy spaghetti and tomato sauce, since I don't have her recipe with me. Thanks Kristen Howe. I bet your mother's sauce was delish! Vespa, what an awesome recipe to make your own spaghetti sauce. My mother used to make her own from canned tomatoes, too. Voted up for useful! Well I have finally gotten around to trying your pasta sauce recipe. It is on the stove and smelling great. I have never tried the anchovies before and I can tell already it is going to add some awesome flavor. Another hour or so and I will be good to go! Thanks for sharing you recipe Vespa. RTalloni, I'm glad you plan to try this sauce this summer. Please tell me what you think of roasting with rosemary if you have a chance to try it. Our tomatoes are just beginning to pop up and now I'm sure looking forward to trying this recipe out when the crop comes on! Your kitchen must have smelled so good that day you roasted them. I wonder if roasting them with rosemary would add anything significant to the flavor. Matt Jordan III, thanks for coming by. Great! Now I'm hungry. 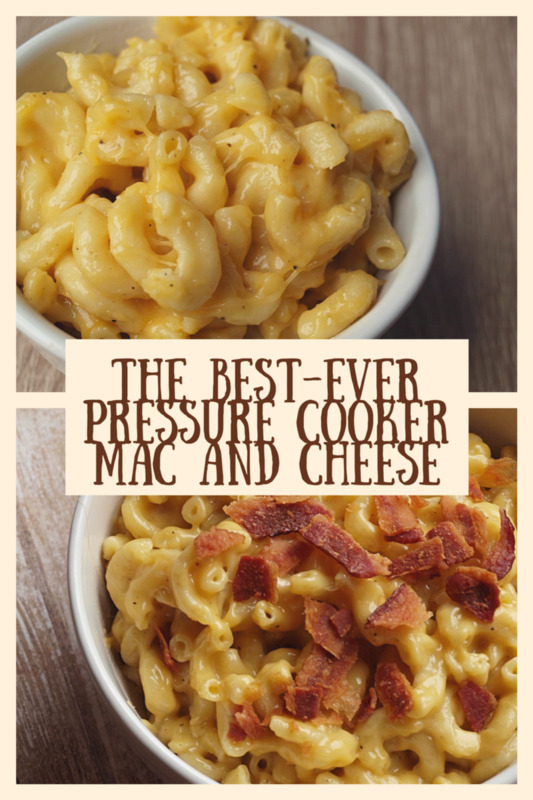 I have got to try this recipe. Gamerjimmy, thanks for your comment. This looks delicious! Add freshly grated Parmesan cheese and a nice bottle of Cabernet Sauvignon and the meal is complete!! - Thanks for sharing. Suzanne Day, I'm so glad this inspired you to cook up a big batch of spaghetti sauce! It's perfect for freezing, too. Enjoy and thanks for coming by. This looks great and I'm going to try it! I can get my sauce to be OK, but certainly not as good as I suspect this will be! I might make up a big batch and freeze it for future use. Thumbs up, voted useful and shared on HP. Marcy Goodfleisch, this is especially delicious with sweet tomatoes. Thanks for your comment! Moonlake, how wonderful to have fresh tomatoes for spaghetti sauce. Thanks for the vote! I had so many left over tomatoes this year. I made spaghetti sauce. Your sauce looks very good. Voted up. 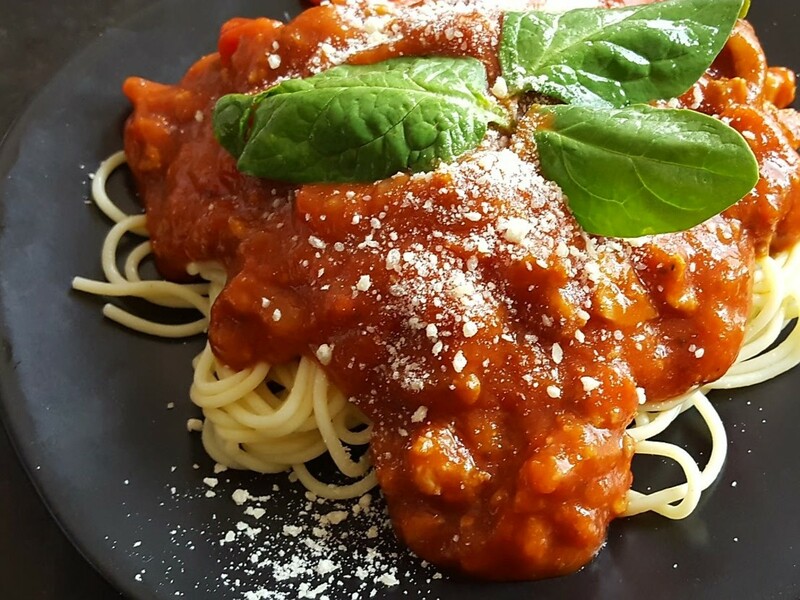 tastiger04, I hope you can try this delicious homemade sauce soon. Thanks for the comment and vote! Akamariabella, I'm so happy you enjoyed this spaghetti sauce...and your first batch, too! How cool is that? Thanks so much for leaving your review and have a great Sunday. I had this bookmarked for 2 weeks - and finally made it. It is amazing. Thank you so so much for posting this. It is my first try at Homemade Spaghetti sauce. It's a hit! ladydeonne, your trademark spaghetti and meatballs sounds wonderful right now. The meatballs adds extra flavor to the sauce, too. 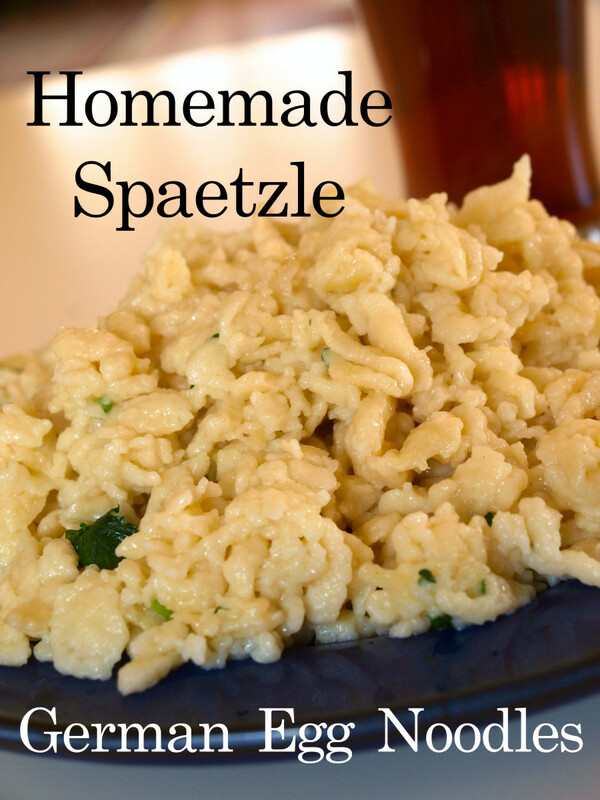 Please let me know what you think if you do have a chance to try this recipe. Thanks for your comment! Your Mexican Salsa recipe led me to this one. 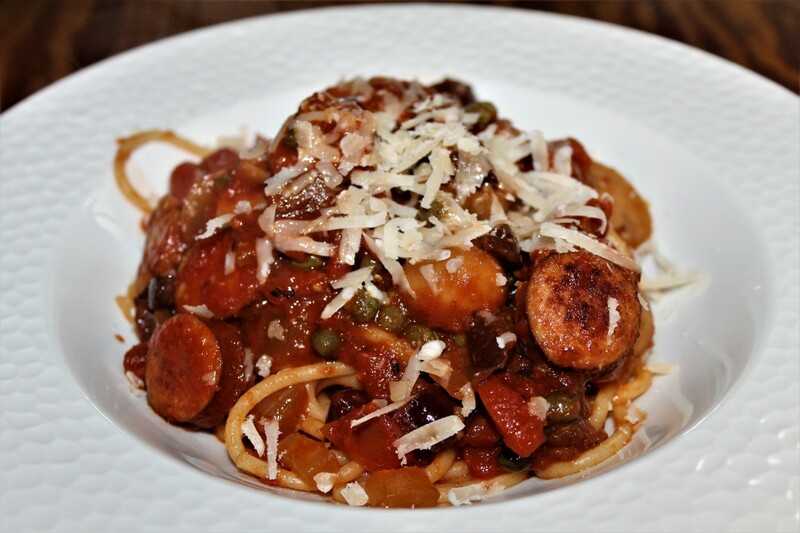 My family and I love Italian spaghetti and meat balls! It is one of my trade mark recipes. I believe that using fresh tomatoes along with the rest of the ingredients in your recipe will be a welcome addition. Can't wait to try it! Vinestal, thank you for pointing that out. I made the clarification in the ingredients: red bell peppers. 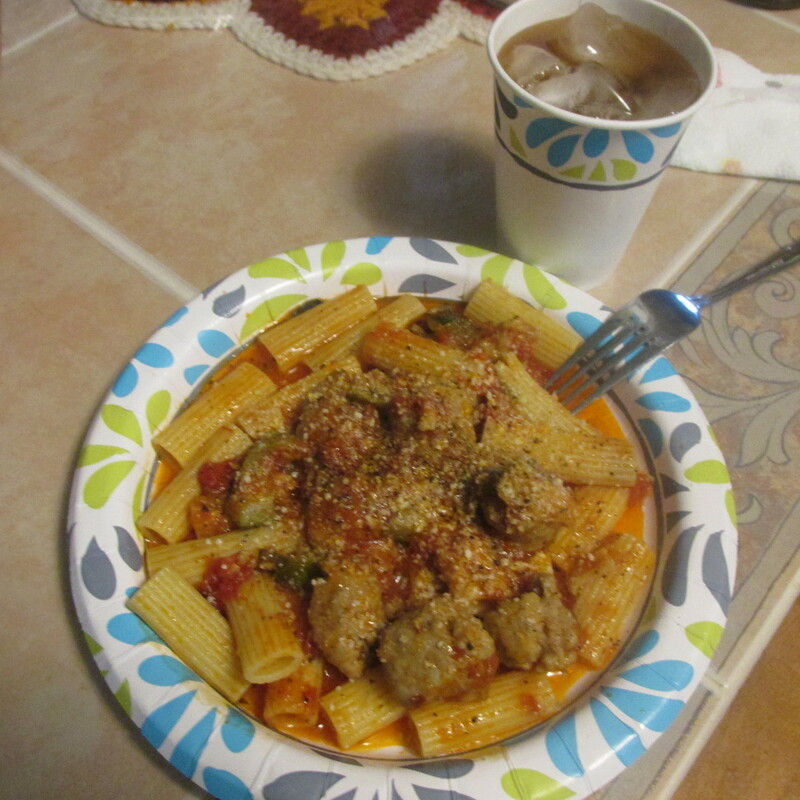 It's hard to beat pasta sauce made with Merlot. I'm getting hungry now! Thank you for taking the time to comment. by red pepper I'm assuming you mean bell pepper? I used a merlot it smells delicious, it's simmering now. What a delicious recipe! 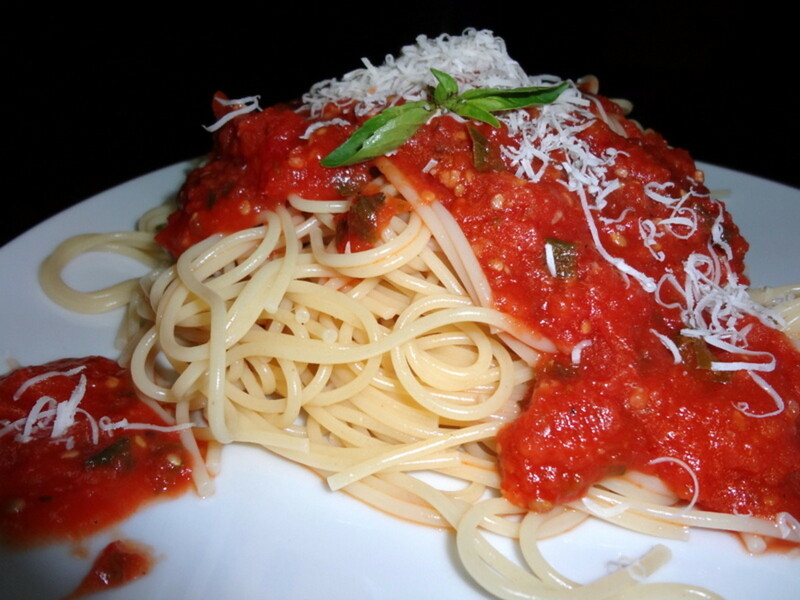 I love Italian food and one of these is spaghetti. I´ll try the anchovy next time I make spaghetti. Thanks for SHARING. Hey this article is great! Thanks. Just the other day I made a sauce and I was thinking one day I must make a fresh tomato soup. I've never made one even though it's easily possible! Adding the anchovies to a tomato sauce is a great idea I might try that! I also didn't know that they dissolve in cooking! Thanks. Thank you so much for dropping by and commenting, KoffeeKlatch Gals. I really appreciate your kind words! You ppictures and descriptions made the sauce so real I could almost smell it. Wonderful recipe. Bookmarked, shared, up and absolutely awesome. Thanks for dropping by and for your comment, alocsin. Wonderful recipe, although I wish I had a source of garden-fresh tomatoes to experience the full taste. Voting this Up and Useful. Great! Thanks for your comment, sgbrown. I'm so glad you dropped by...this hub was written just for you and others who have too many tomatoes. All your homemade goods sound wonderful! I grew up watching my grandfather garden and my mother and grandmother canned, preserved or froze much of the bounty from the garden. When I had my first garden as an adult, the first year I planted 43 tomato plants. Yes...43! I had enough tomatoes to feed the entire neighborhood and then some. Needless to say, I canned and gave away and ate tomatoes in every form to our hearts content. Your recipe sounds good. Roasting does bring out a rich and sweet flavor in most all vegetables. Sounds like you are having a good time down there in Peru! This recipe IS foolproof. I hope you have the chance to try it someday, when you can find cheaper tomatoes! Great, thanks so much for your feedback barryrutherford. I have taken your advice and changed the font back to normal. : ) Please continue to mention anything you notice that can improve my hubs! You're welcome viking305 and thank you for stopping by! Well, I happen to love freshly baked bread! Do you plan on publishing your homemade bagel recipe in the future? I'd love to give it a try! Great ideas here for making sauces with tomatoes. You have given us step by step instructions with some good photos too. Sounds great! I would definitely include the anchovies - and maybe add a few more. As you say, they aren't as scary as people make them out to be. I love cooking with them. I would also use the wine to deepen the flavor. Besides, it's always good to have an open bottle of wine in the kitchen. Cooking is thirsty work! Finally - great tip on the roasting. Peeling tomatoes isn't hard, but I've never enjoyed doing it. Roasting and killing two birds with one stone sounds great. I'll definitely try that next time. Well, I'm not an anchovy person, but the rest of the recipe makes my mouth water for fresh tomatoes for EVERYTHING! I even eat tomato sandwiches (with my homemade bread and bagels, of course)! It's a perfect way to greet guests of all ages. Yummy Yummy Yummy!